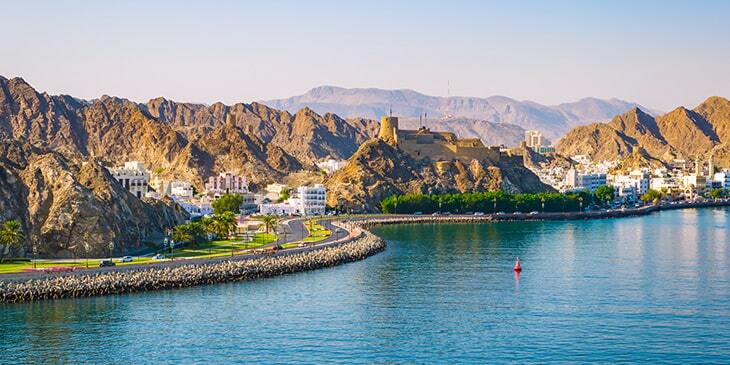 Muscat, Oman’s capital city is one of the most stunning cities in the Middle East. It’s a more charming, slower paced city than its neighbouring cities of Dubai and Abu Dhabi, and it’s surrounded by breath-taking mountains, desert landscapes and the Arabian Sea. Visit Muscat and look forward to admiring captivating architecture, immersing yourself in cultures, meeting warm and friendly locals, visiting grandeur palaces, browsing traditional souq markets, chilling out at shisha lounges and relaxing on alluring white sandy beaches. Muscat has many traditional Arabian cultures and a long and fascinating history which is definitely worth discovering. Visit the Al Jalali Fort, a preserved heritage site and former prison which was built back in the 1590s during the Portuguese occupation. Afterwards, head to the UNESCO World Heritage Site of Bahla Fort, the ruins of an Omani fortress. This fort and settlement was built by the Banu Nabhan tribe who ruled the region from the 12th-15th century. To dig deeper into Muscat’s past, visit the Bait Al Zubair Museum, a cultural and heritage centre displaying the country’s largest permanent art collection, as well as Omani artefacts including weaponry, jewellery and photographs. Muscat is a land of many interesting sites and attractions. The Sultan Qaboos Grand Mosque is definitely the main must-see of the city; it’s one of the world’s largest mosques which was built to mark the 30th year of reign for Sultan Qaboos, featuring stunning Islamic architecture, stained glass windows and mosaic embellishments. Another popular Muscat attraction is the bustling Muttrah Souq, a colourful network of traditional markets and shops selling everything from antiques and textiles to jewellery, incense, perfumes and clothing. Then there’s the Royal Opera House, the city’s arts and culture hub featuring a beautiful marble exterior; the venue has been visited by famous opera and ballet artists who have performed here. Muscat is also renowned for its nearby breath-taking natural wonders which make for great daytrips; hike up Jebel Shams, Oman’s highest peak which has an altitude of over 3000m. Visit the Al Kasfah Spring for a dip in its sulphate waters that supposedly promote healing; and finally, venture out to the Empty Quarter, the world’s largest area of continuous sand for a 4x4 drive and experience desert camping under the stars. Book direct flights to Muscat with Brightsun and look forward to boundless adventures in this majestic city.